If 262 people got together to "Occupy" Wall Street or Washington D.C. or Los Angeles City Hall or anyplace else would it be news? 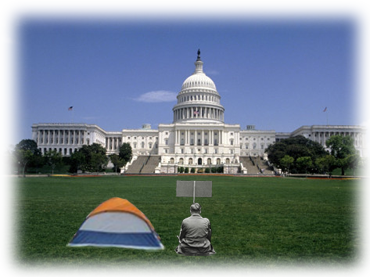 If the occupiers said, "OK we have to have at least one person here all the time. Hopefully some others will show up every so often" would that be news? If one person "occupied" a location and over the 3 hours he was there another 30-50 people passed in and out of that same location, was there 1 occupier or 30-50? 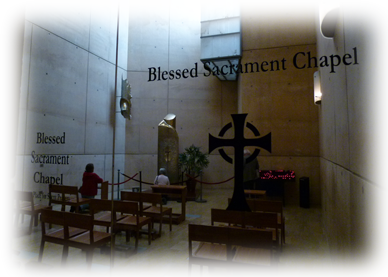 Is Perpetual Adoration the same as Occupy Adoration? When the Lord said to Joshua "You shall march around the city, all the men of war . . . then all the people shall shout"
would it be OK if just a few of the men of war marched, or if instead of all the men of war marching, two or three took shifts? Instead of all the people shouting, maybe just those who felt like it? Blessed Mother Teresa told a prominent Catholic theologian that "if every parish in the United States offered three hours of Eucharistic adoration each day, abortion would end." Did she really mean every parish? Every day? How many parishioners? One? Two? Christian communities throughout the world", did he really mean all parishes? OBVIOUSLY THE OCCUPY ADORATION MOVEMENT HAS A LONG WAY TO GO. THE MOVEMENT NEEDS YOU! Prayfully consider organizing Adoration at your parish. You will have crosses but the blessings will outweigh it. 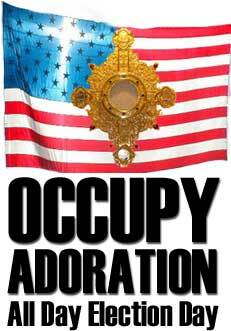 The term "Occupy Adoration" has been dinking around the Social Media sites for a while. There are some scattered Facebook pages and a Twitter hashtag for #occupyadoration. Below is a place for Facebook comments if you are so inclined. We propose 40 Daily Holy Hours in the presence of the Blessed Sacrament and/or 40 Daily Masses praying that the institution of marriage remains a holy institution. The Supreme Court heard arguments March 26th & 27th on a pair of cases challenging state and federal laws that define marriage to include only unions of a man and a woman. The first case, Proposition 8 from California, was passed in 2008 and subsequently rejected by the California State Supreme Court. The second case from New York challenges the 1996 Defense of Marriage Act, which defines marriage as a union between one man and one woman law and requires the federal government to deny benefits to gay and lesbian couples married in states that allow such unions. In November 2012 four state proposals all voted against the traditional Catholic Christian Biblical definition of marriage. Millions of dollars have been spent on both sides of the issue. Now, only prayer can work. 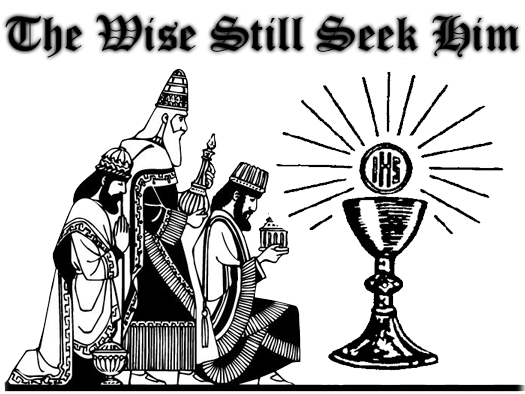 We need to unite in Eucharistic Adoration and petition our Lord, who instituted the Sacrament of Marriage, to influence the Supreme Court. We propose 40 Daily Holy Hours in the presence of the Blessed Sacrament and/or 40 Daily Masses praying that Pope Benedicts XVI’s successor is a holy, saintly man. If the priest is lukewarm, his parishioners will be bad. With love and respect for the beloved Cure d’ Ars, blaming out holiness, or lack thereof, on the holiness of our parish priest lets us off too way easy. The priests we get, the bishops we get, and the pope we get may just rely on us, not them. We propose if we are lukewarm, we get lukewarm priests, bishops, and popes. We must remember that not all popes are holy. Some have been quite the opposite. When Pope St Celestine V resigned, he was followed by Boniface VIII who was not a saint & whose pontificate was troublesome. Pope Boniface VIII was followed by over 20 popes none of whom were canonized Saints, until Pope St Pius V. Pope St Pius V came after the Protestant Revolution which, like it or not, began due to a scandalous Catholic Church. We do not want to wait 272 years for a saint pope. We want one 40-50 days from now! If ever there was a Lent that needed extra prayers & sacrifices in the history of the world, this is it. Make no mistake. The Holy Spirit does not dictate the next pope. The cardinals are not puppets. In a 1997 then Cardinal Joseph Ratzinger, as top doctrinal official for Pope John Paul II, spoke of a misunderstanding on how the Holy Spirit works in the conclave. INTERVIEWER: "Your Eminence, you are very familiar with church history and know well what has happened in papal elections. . . . Do you really believe that the Holy Spirit plays a role in the election of the pope?" RATZINGER: "I would not say so in the sense that the Holy Spirit picks out the pope, because there are too many contrary instances of popes the Holy Spirit would obviously not have picked. I would say that the Spirit does not exactly take control of the affair, but rather like a good educator, as it were, leaves us much space, much freedom, without entirely abandoning us. Thus the Spirit's role should be understood in a much more elastic sense, not that he dictates the candidate for whom one must vote. Probably the only assurance he offers is that the thing cannot be totally ruined." Earlier in 1978 Ratzinger warned of "pressure from the forces of the left," seeming to hint that the media and secular governments would be attempting to sway electors to produce a "modern" pope, who would soften the church's traditional doctrinal commitments. Let us not rely on the holiness of others for God to grant us a holy Successor to #Catholic Pope Benedict XVI. Augustine said "Pray as though everything depended on God. Work as though everything depended on you." We dare to alter this statement a bit. When it comes to getting a holy successor to Benedict XVI, pray and sacrifice like everything depends upon you alone. REST ASSURED the Holy Spirit will guide the election of our next #catholic pope. PRAY CONCERNED the Cardinals heed that guidance. 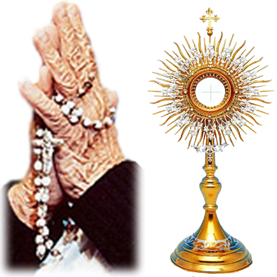 Adoration Servants can cite tangible evindence that over the past few years Perpetual Adoration is in decline! This must be considered an unacceptable situation in our time. Beginning on the Feast of the Mother of God (Tuesday January 1st) until the Epiphany (Sunday January 6th) we propose the First National Eucharistic Signup Sunday Week. We begin praying on New Year's day that Eucharistic Adoration Signup Sundays conducted by Eucharistic Adoration Chapels throughout the country and world will be fruitful in bringing more adorers. This is perfect timing for Adoration Signups as during Advent and Christmas most parishes do not want much activity after the Sunday Masses and, in addition, the business of the season does not bode well for many signups. But after New Years people are ready to wind down from the season, are hopefully closer to God after Advent, and will be ready for the perfect New Year Resolution, a weekly holy hour with God. In addition January 6th is the feast day of St. Andre Bessette, friend of St Joseph and dedicated Eucharistic Adorer. We take St Andre as our special patron for this event which we pray will become standard in the years to come. Adoration Servants has been told by good Catholics that prayer is not as important as political activity. We don't agree but here is what we propose. On November 6th we do only 3 things that day. We eat (or fast); we vote; we adore. We take off work and SPEND ALL DAY IN ADORATION. It is election day. The time for political action is over. Now we pray before the Blessed Sacrament around the country. Let's show God we are serious enough to spend an entire day in adoration and petition. At this event there will be no need for picket signs. No need for marches. There is one target and that is God Himself, our Sacrifice, before us in the Blessed Sacrament. We will direct our attention to him because as he tells us in John 15:5, without Him we can do nothing. Click here for a maintainable poster. Adoration Servants has been told by good Catholics that prayer is not as important as political activity. We don't agree but here is what we propose. 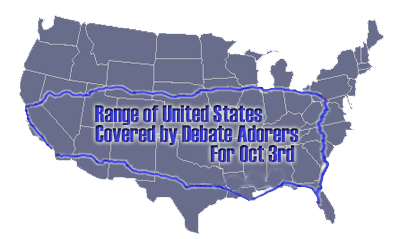 October 3rd is the first U.S. Presidential debate between Obama and Romney. Many Catholics already know who they are going to vote for no matter who "wins" the debate. If you know who you are going to vote for and you want that person to win the debate as yourself: How can I better help the candidate of my choice during the time when the debate is taking place? We propose that INSTEAD OF SITTING IN FRONT OF YOUR TELEVISION WATCHING THE DEBATE GO BEFORE OUR LORD IN THE BLESSED SACRAMENT AND PRAY!!! Jesus tells us in John 15:5, without Him we can do nothing. So make this sacrifice for the presidential candidate of your choice and for good of the United States and the world. You will do more good there than just watching the debate both by your prayers and by the sacrifice of not watching an event you really want to watch. 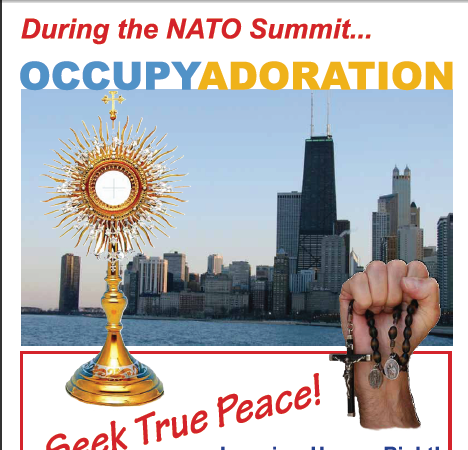 Occupy Adoration NATO Chicago May 20 & 21, 2012. The NATO Summit in Chicago was prepping for many protests, many groups, much activity. It appropriately took place on the feast of St Bernadine of Siena, a Franciscan who started his holy life doing works of charity to the sick, and the feast of St Christopher Mallanes and Companions, Martryrs for Religous Freedom in Mexico last century. We called for all Catholics to Occupy Adoration chapels duing the NATO summit that much good would come from it and that it would be a peaceful summit. With the help of Franciscan nuns in Chicago Adoration Servants created a flyer which the nuns put up all around the Chicago protest areas inviting people to pray in adoration at nearby chapels. The first Occupy Adoration event under the auspices of http://www.occupyadoration.org/ was really an over-the-shoulder, spur-of-the-moment event. We had only aquired the domain name a day or two before and had to be in downtown Los Angeles in chaffuer capacities. So with about 24 hours notice we put out the call to our seven Twitter followers, our dozen or so Facebook friends, and went.